There’s a common misconception that an alkaline vegan lifestyle is also an expensive one, but that is totally up to the individual budget. The wonderful thing about being an alkaline vegan is that it cuts out a large percentage of eating processed foods as well as eating out. When you purchase foods on impulse and foods out of season , a alkaline vegan lifestyle can definitely break the bank. If an omnivore ate nothing except filet mignon, lobster and dined out daily, that would get pretty expensive too, right? The following tools will equip anyone on this path with eating a variety of alkaline vegan foods, purchasing essentials, to stocking a vegan pantry without maxing out your food budget: eat real food, and cook from scratch when you can. Now you may be thinking that sounds easier than done, but hold up there are more tools to help: Here are some tips and tricks for eating a healthy, alkaline vegan lifestyle without spending excessive amounts of money or spending all dy.
. If you know you want to make a bean dish, soak them overnight to speed up cooking time. It’s so much easier to make a meal after a long day when some of the prepwork is already done. Juice Machine: Juicing fresh fruits and fresh vegetables are a part of the vegan lifestyle and although it is not necessary it will be beneficial. Crockpot: Lunch sized it’s perfect for carrying meals to work or while traveling. Easy to use and a no worry mindset about warming meals and it also helps to totally avoid the microwave. Put your grain of choice with enough water to cook into the bottom of your rice cooker, then layer veggies and garbanzo beans into the top. Turn the cooker on, and it makes the whole meal while you do other things. Toss beans, veggies, broth, onions, and spices into the slow cooker and let it go. Cook up some pasta on the stove and toss with a quick nut cheese or pesto for a fast meal. Up the health value by tossing in some steamed veggies, like dandelions greens, and mushrooms. You can also do batch cooking on the weekends, preparing a few dishes to keep in the fridge for busy evenings. Casseroles, pasta salads, and roasted veggies are a few great staples to have on hand for weeknight meals. While roasted veggies might not make a whole meal, it is an awesome compliment to most meals. You might think that farmers markets are expensive, but that’s not always true. A recent study showed that it’s actually cheaper to shop at the farmer’s markets. 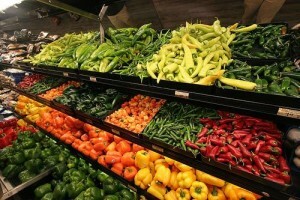 Buying in bulk is one of the easiest ways to save money at the grocery store. Hit your store’s bulk bins for some real savings! You can get as much or as little as you want, and bulk items are cheaper because you’re paying for the food, not the packaging. You may also want to consider joining a local wholesale store to stock up on grains, nuts, oils and other items like fruits and vegetables. I’d love to hear from other alkaline vegans out there! Do you have any tips for sticking with a alkaline vegan lifestyle while on a budget? Next PostNext What Is Your Favorite Go To Herb?